Week 5: In The Census- A Mystery! It’s week 5 this week of #52Ancestors, and this week is “In The Census”. This week I am going to tell you a story about things that draw questions. So here it is: The photo you see above is part of the 1900 Wisconsin Census, and I initially received this photo from a distant cousin of mine. This census lists my ancestors as follows: George Wylie (1848-1926) *3rd great-grandfather, Head* Ida (Carpenter) Wylie (1852-1930) *3rd great-grandmother, Wife*, their two children: Frederick Marion Wylie (1883-1950) *2nd great-grandfather, adopted* and Christina Gertrude Wylie (1887-1920) *3rd great-aunt, adopted*, it also lists near the bottom of the WYLIE column George Wylie’s mother, Rachel Wylie (1820-1908) *4th great-grandmother, Mother* Digging deeper into this census, I wanted to find out why this record had my 2nd great grandfather Frederick Marion Wylie and his sister Christina Gertrude listed as adopted, so I first started from the source of whom I got it from. She just said that they were both adopted and that’s all that she knew ( this distant cousin lives in California, not Wisconsin). So then I went to the internet and chatted amongst my Genealogy Facebook friends, and eventually found out that even though I have my 2nd great grandfather Frederick Marion Wylie listed as biologically being related to his parents and (adopted) sister Christina (all listed above), as well as biologically connected to me and my family in my tree, as his descendants, the bottom line is that neither he nor Christina were biologically related to their parents or each other!! Therefore Frederick Marion Wylie is not (technically) related to me. Well I hope you have enjoyed my latest blog post!! This week’s post is about a special dinner memory that I have had for over 3 decades. My maternal grandparents used to have Thanksgiving dinner in the basement of their Milwaukee home. Those dinners are still some of the best family memories that I have. My grandparents had this kitchen in that house that was literally twice the size of my closet that I have now with no dishwasher. My family would sit around the basement television and watch the Packers play on Thanksgiving while the food was cooking, oh I also remember us having some HUGE Packers pools on those games, I mean usually on that one night, you could go home with $50-$100!! My grandparents first started out with just covering their pool table, but then the amount of friends and family grew so did the amount of tables! !The basement also had a built in bar complete with its own built into the wall refrigerator!! My grandparents eventually had to have a total of 3 different sized tables squeezed together for all the food and friends and family that came to their annual Thanksgiving party. Anyway even though my grandparents didn’t have a dishwasher and each dish had to be hand carried one by one down a long flight of metal basement stairs. I really wish that I could find the photo of all of us sitting in my grandparents basement in their Milwaukee house. I will never forget those Thanksgiving dinners as long as I live!! Week 3: (Longevity) My Oldest Living Family Member!!! Patricia’s husband John Edward Butler passed away on July 28, 2007 in Laurinburg, North Carolina, he was 85 years old and at that time, Patricia was 84 years old, they had been married for over 60 years before his passing. Last September, Patricia celebrated her 95th birthday!!! My 4th great grandfather, John Cox Atlee (B: March 22, 1816 in Maryland D: September 15, 1899 in Fort Madison, Iowa) pictured above with his great grandchildren, came to Fort Madison (Lee County) Iowa in 1837 when he was only a carpenter. On April 19, 1838 John Atlee (22 at the time) and his wife Emeline Stone Brooks (23 years old) got married in Fort Madison. In 1844, Emeline and John relocated to a farm in Cedar Township, and in 1852, John started making plans for the Lumber Company with his older brother Isaac R. Atlee (1813-1891). The brothers remained in business together until 1854 when Isaac decided to retire. So John Cox Atlee continued on with the business forging a partnership with Nathaniel Bennett and built a mill on the site where the business was. When John’s eldest son Samuel John Atlee came of age, he succeeded Mr. Bennett and the firm became what it is still known as: S & JC Atlee Lumber Company, it was at one point one of the most extensive lumber producing firms along the Mississippi River. Their mills consist of a saw-mill, which is supplied with machinery of the most modern pattern, a brick planing-mill, 75×75 feet, two stories high, which is a model of neatness and order. Everything in this mill is arranged with a view of economy. The machinery is all new and of the very best kind known to the business. Near by is their dryhouse, of large capacity. Then comes their shinglemill, that has a capacity for making and packing 120,000 shingles per day. The mills, stables, yards, etc., cover an area of about thirty-five acres, and give employment to 150 men and boys, to whom they pay $2,500 monthly. The firm buy their logs up the river, and run them down in great rafts, and consume about 10,000,000 feet annually. Their lumber is sold to all parts of Southern Iowa, to Missouri, Kansas and Nebraska. J. C. Atlee, the founder of this immense business, is a man of wonderful genus and enterprise. He commenced the world with nothing, and has fought hurricanes, fires, floods, ice-gorges and boiler-explosions, and conquered every time. The more opposition and disaster crowded, the more determined he seemed to become. In November, 1858, the mill-boiler exploded, killing four men, Andrew Fulcher (the engineer), the fireman (a colored man), Jacob Minder and Albert Tracy, and two boys, Willie Kirk and George Tracy, and blowing the mill to atoms. Atlee helped bury the dead, and then commenced rebuilding and repairing, and soon had everything in operation again. On May 3, 1866, that mill was destroyed by fire. In just seven weeks, it was rebuilt, on a large scale. The first mill had a capacity of 15,000 feet per day, and the second oneof 40,000 feet. It proved too slow to suit Atlee’s notions, and he tore it down in a few years and built the present mill, which has a capacity for cutting 65,000 feet per day. On the 3rd of July in 1875, a furious hurricane came along and unroofed Atlee’s residence and otherwise injured it. He was absent at the time, and when he came in sight of his ruined home and found his family all safe, he swung his old hat and shouted “All right; we’ll try it again.” He went to work the same day, completed his plans and rebuilt on a grander scale than before. The same storm played all sorts of tricks at the mill-yard. It blew down the great piles of lumber, filled up the alleys and carried thousand0 of feet into the river, where it was lost; it blew their steamer, Jennie D., loose from her moorings and clear across the river, where it sunk in fifteen feet of water. The damage to the mill-yard was about $5,000. But none of these little things discouraged the old man, they only whetted his appetite, brightened his business ideas, strengthened his enterprise and stiffened his backbone. To quote the words of his excellent wife, they never “cried over any of their mishaps and misfortunes.” Nothing short of an earthquake or volcano will ever discourage J. C. Atlee. Peter was the last child and 4th son born to Peter Okell and Martha Corker on February 6, 1834 in Cheshire, England. He lived an amazing life, in his birth year in England there was a worldwide Cholera outbreak and although he survived it, many others died. He married his wife Martha Atlee on January 29, 1860 when Peter was 25 and Martha was 19 years old in Fort Madison, Iowa. In their 50 years of marriage Martha and Peter had 5 children: Charles Lincoln Okell (1860-1931), Franklin Alexander Okell (1864-1932), Emeline Atlee Okell (1866-1935) John Atlee Okell (1870-1948) and Sadie Maria Okell (1874-1935). Peter served in the American Civil War from its beginning in 1861 until its final year in 1865, by that year (1865), Peter was already 31 years old. After the war ended, he went on to work for the family business S & J.C. Atlee Lumber Company, he worked there for a number of years until his death on October 6, 1910, in Iowa City, Iowa, at the age of 76 years old. 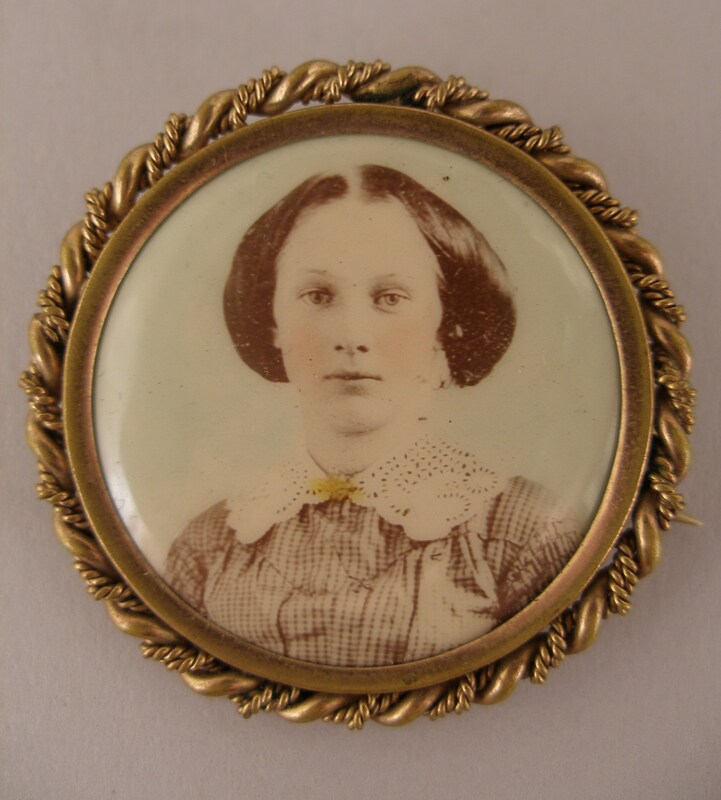 Martha Darling Atlee was the first daughter and 3rd child to John Cox Atlee and Emeline Stone Brooks on July 16, 1840 in Fort Madison, Iowa. Her father was 24 and her mother was 22 years old at her birth. Martha had one younger sister, and two older brothers. Here they are in birth order (without Martha): Samuel John Atlee (1863-1913), William Henry Atlee (1854-1933), and Margaret Lillian Atlee (1862-1949). For Martha and Peter’s marriage, please read the information on her husband, Peter Okell. After Martha’s husband Peter passed away in 1910, Martha remained in Fort Madison, Iowa until her death on October 10, 1916, at the age of 76 years old. 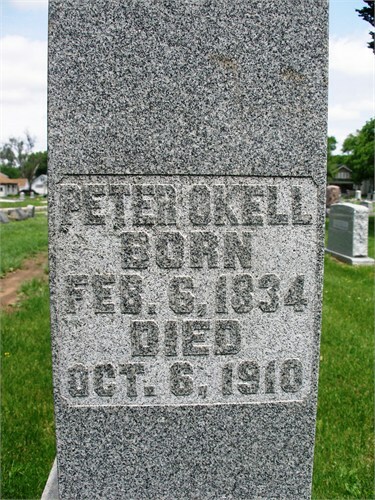 Both Peter and Martha Atlee Okell are buried in Fort Madison, Iowa. I am going to start with another branch of my family tree. This surname is Atlee and as of today, there are still some living descendants of the original line. Although I have been able to trace the Atlee’s from me all the way back to my 12th great-grandfather being born in the year 1500 in England. I hope you enjoy my research and continue reading my blog entries!